the “Maxi” magazine, convinced me to contact NoTube and to take the plunge. I created an association to collect donations. We were finally able to participate in this great adventure from April 25 to May 8, 2015. The beginning was difficult. These 15 days were really intense. Switching from 500ml of formula per day to 0ml in a few days was psychologically difficult, as well as seeing her losing weight. But it is an important step, aimed to see how children interact with food. Today, Gina is only fed by tube at night, not during the day anymore. Our life has changed, she now eats “fromage frais” (creamy fresh cheese) 2 per day, soft cheese “La vache qui rit”; she licks ham, salami, chips; tastes ice cream, cotton candy; and from time to time a little bit of puree… Of course, it’s just in small quantities but it is such a pleasure to see her eat, taste and ask for more. She even insists on going to McDonalds. It’s fun to see her so excited on the way there. She loves to put cheeseburgers in her mouth and chew small pieces. 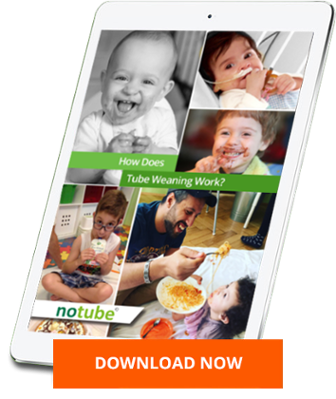 NoTube is a life changer. No need to worry about the pump anymore, nor the fitting or the formula, no need to plug the pump, to switch it on… All these little changes reshape your daily life. Now we can go out without having to worry about the time we should stop to eat – it’s stress free! Of course Gina still takes food supplements, and it’s a good thing since we must let children follow their own pace and let their body adjust to this change. We are very pleased to have participated in this Eating School. The donations allowed our little princess to participate in this wonderful adventure! NoTube deserves to be known, it’s an amazing team with great advice. Trust your child!